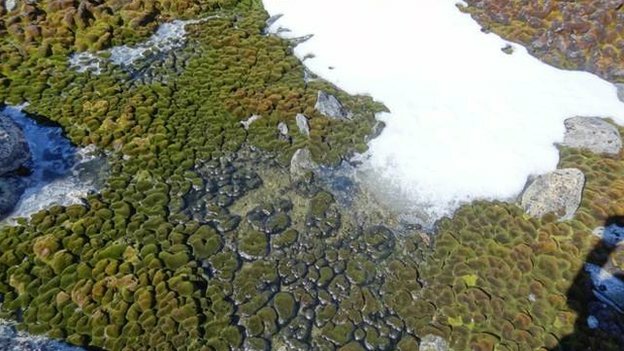 Moss plants that survive the freezing conditions of Antarctica have an unusual food source, scientists say. The vibrant green plants take nutrients from the poo left behind by penguins that lived in the same area thousands of years ago. Scientists made their discovery whilst testing the plants to find out how they manage to survive in the icy landscape. The findings were presented at the Society for Experimental Biology's annual meeting in Salzburg, Austria. Prof Sharon Robinson, from the University of Wollongong in Australia, has been studying Antarctica's plants for 16 years. She explained that she was interested in where the plants get their nutrients, because the Antarctic soil on which they grow is so poor. Love the idea that frozen crap from thousands of years ago is feeding plants now! Yes its great how the planet recycles!